A few gifts for the sweet tooth at the 38Makers holiday gift fair inside the colorful and pintastic Pinterest headquarters! We’re thinking stocking stuffers… or maybe just office snacks. 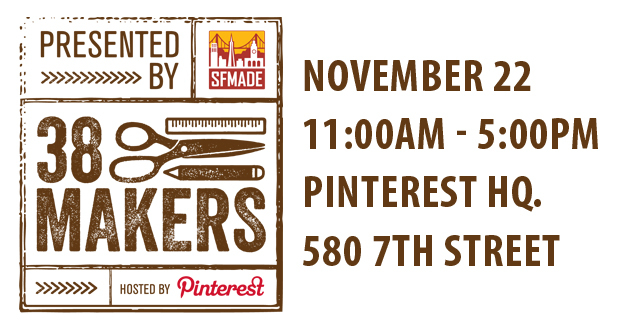 New SFMade members Le Dix-Sept will have nougut galore! Always a favorite, Kika’s Treats caramels are made with coconut palm sugar, a tasty sweetener with a natural deep caramel flavor. Tiles from Poco Dolce: Elegant, tasty, and way too easy to keep eating. Grab an Awesome Bar gift basket for all the outdoor enthusiasts who like a snack… you could even pair it with a Rickshaw tote while you’re at it. Saint and Olive’s biscotti come in winter flavors like cranberry pistachio with white chocolate, spiced chocolate cherry walnut, cornmeal molasses with hazelnut, and walnut pistachio with black pepper. Grandma didn’t have time to make you her homemade jam this holiday season? Grandma’s Homemade Jams has you covered.